What did I expect? A better version of Happy Days. What did I get? A teen hijinks movie niftily masquerading as a thoughtful character study, American Graffiti introduced George Lucas’s considerable narrative gifts to the world. Everyone my age (42) and younger experienced the shock of discovering that the dude who made Star Wars — Star Wars! — had started out with this bittersweet, nostalgic love letter to youthful misadventure, but in truth, Lucas’s overwhelming command of the medium, penchant for trite profundity, and implacable lust for mindshare are everywhere evident. Like Star Wars, it’s an incredibly appealing contraption of surfaces; like Star Wars, its depth/lack of depth was central to its appeal. 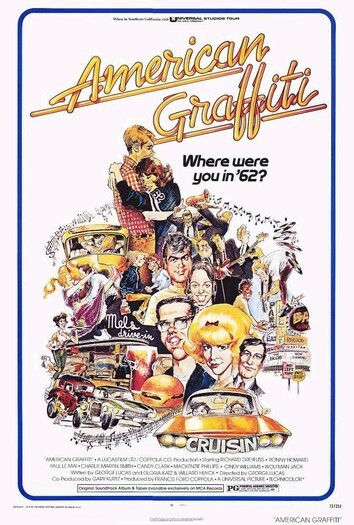 Lucas’s blithe unconcern over traditional narrative conventions gives American Graffiti a powerful immediacy; it’s less Act I, Act II than continuous unmediated access to the Now. The movie constantly recapitulates in medias res; we’re always entering the action late and catching up. While not identical, the four principals (Terry, Steve, Curt, and John, for the record) are interchangeable enough that the question of getting to “know” any of them is beside the point. Are they likable? Are they believable? Who knows? They’re mostly projections anyway. The absence of differentiation among the characters happily goes to the movie’s point, which is to excavate the stirrings of heedless youth and the feeling of doomed/ensured future that are every (male) suburbanite’s inalienable birthright — as those sneaky end captions emphasize. The gap between the innocent, heady shenanigans of 1962 and the fates that await them is the movie’s true subject. It’s critical to Lucas’s schema that two of the four fellas meet with violent tragedy, while the other two achieve a far more quotidian accommodation with adulthood. Curt, the writer, is obviously meant to be the best off of the bunch, but the point is, it’s a binary. Lucas doesn’t have the subtlety to imagine a fate that combines, say, a stint in Vietnam and a career in insurance. Furthermore, it was a little early to be writing epitaphs for these characters, wasn’t it? (The ones who live, anyway.) The oldest of them would only have made it to about 30 by 1973. Not unlike the undifferentiated quartet of protagonists, the endless, free-flowing jukebox soundtrack also is just a touch unearned: ostensibly diegetic but mostly — if you watch closely — not, the songs could be rearranged any which way without losing much of the effect — this is not how we ordinarily praise movie music, is it? But precisely by rejecting such mundane narrative concerns, Lucas achieves a far bigger payoff. Is Lucas standing on the shoulders of giants (Bill Haley, Frankie Lymon, The Platters, et al.) or elevating them? As gratifying as the songs are, they’re a guilty pleasure offered without a shred of guilt — a good recipe for making a billion dollars…. To his credit, Lucas has a tendency to go for broke dramatically, as seen in the Suzanne Somers vignette (a pretty, nameless girl in the next car over mouths to Curt — probably Lucas’s surrogate — that she “loves” him, only to vanish the next instant); the opposite of realistic, it’s an idealized projection, a fantasy. Similarly, Curt’s insouciant indifference to a fat check intended to pay for his education is a bit distancing. What Modesto kid is going to just throw away two thousand bucks — in 1962 dollars? Only a former hot-rodder like Lucas would do such a thing, but, to be fair, it’s a decent analogue for growing up at the height of American prosperity and horizon. I’m being hard on Lucas, but I’m very suspicious of his art. Lucas presents a particularly compelling version of the form/content problem — I personally don’t regard Lucas as a fertile source of information about the human condition, but he’s so gifted that he can execute an end run around the issue. (Most narrative artists can’t.) And the same is true of Star Wars — it’s really his signature trait as a filmmaker, a busy, dazzling surface that promises oceans beneath. A gizmo kid with unsurpassed skill at making movies, Lucas served the audience cinematic bliss of a potency that nobody else — literally, nobody else — has ever matched. As everybody knows by now, such pleasures come with their frustrations. What here smacks of 1973? As one of the quintessential Boomer movies, tons. Honestly the most 1973 thing about this movie might be the Californian sense of unending possibility. The Eagles were about to get real big, too. IMDB synopsis: Two boys are scheduled to leave for college in the morning. Each has his own doubts. They spend a final evening cruising the strip and have every adventure possible before dawn when they will each have to decide what they will do. I had no idea that George Lucas directed this, but I guess now I see why this movie is still as big as it is today. Although this film came out before my parents thought of conceiving me, I enjoyed the music and the carefree way that these teenagers spent their night. I added American Graffiti to my Blockbuster @Home queue because I had always heard people refer to it, and because one of the women I work with at DISH told me that it’s a good movie. I was especially shocked at how easily the girls jumped into cars with guys they didn’t know, or just walked sketchy looking streets on their own. It was certainly a different time! I was fully expecting some kind of tragedy to happen at the end, other than facing reality and growing up, but I wasn’t expecting the let down of a quick sentence about the futures of each of the guys. Great review, by the way!